First King of the Second Dynasty, his name means 'Pleasing in Powers'. 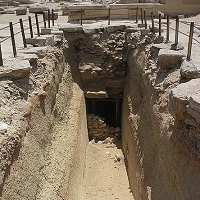 Hotepsekhemwy is the founder of the second dynasty. The Horus Name (Hotepsekhemwy) was the royal titulary most important name in this period; it was received at the accession. His birth name was Hotep which passed in the royal titulary as both Nesut-bity and Nebty name of the Horus Hotepsekhemui. We are told that his nebty name meant, "the Two Mistresses are at peace". Seal impressions found in the western one of the two Saqqara tombs south of the Netjeryhet complex, under the pyramid of Unas. The Royal estate of Hotepsekhemwy is attested on the seals with the name 'Hwt Nswt-Bity Nebty HTP'. Statuette (pink granite) of a kneeling priest (Cairo C.G.1) once called Hotepdief and now more probably identifiable as Redjit . A bone cylinder perhaps from Helwan is at the Brooklyn Museum displays the serekh of Hotepsekhemwy in simplified but sharp drawing. 4 stone bowls fragmentary inscriptions found by Petrie in the Umm el Qaab tomb P (Peribsen) and one found in the tomb V (Khasekhemwy) at Abydos. Two inscribed stone bowls of Hotepsekhemwy were found by Reisner in Menkaura' s pyramid complex at Giza . An alabaster vessel fragment also bearing his serekh has been found by Brunton in the grave 3112 of Badari.